Data science has many characterizations, but in academia it is often talked about as pushing the limits of both methodological and domain science, what Josh Bloom, a Professor of Astronomy at U.C. Berkeley, has referred to as “novelty squared”. Bloom sees this as the “great challenge of modern interdisciplinary scientific collaboration”. The idealized characterization of data science in academia is also represented in the idea of shifting from the traditional T-shaped scientists, who have deep expertise in a single domain, to Π (Pi)-shaped scientists with deep expertise in both a domain and methodological science (as coined by Alex Szalay and discussed here and here). As Π-shaped data scientists, they are primed to innovate in multiple disciplinary trajectories. Bloom and others have argued that these characterizations of novelty squared and Π-shaped scientists represent the “unicorn” of data science. The mythological, elusive nature of the ideal data scientist was supported through our ethnographic fieldwork. In search of these so-called “data scientists” across the data science environment, we could find scarcely anyone who consistently identified as a “data scientist.” We found more often that “data scientist” was a partial and relational identity, one layer of many. We encountered lots of data science, emerging across a network of interactions across a multitude of differently shaped scientists, from T to Γ (Gamma) to Π to even Μ (Mu) -shaped! Individuals mostly did not see themselves as particularly Π-shaped, a category many reserved for only a very select few that had accomplished an exceptional level of expertise and contribution to multiple fields. 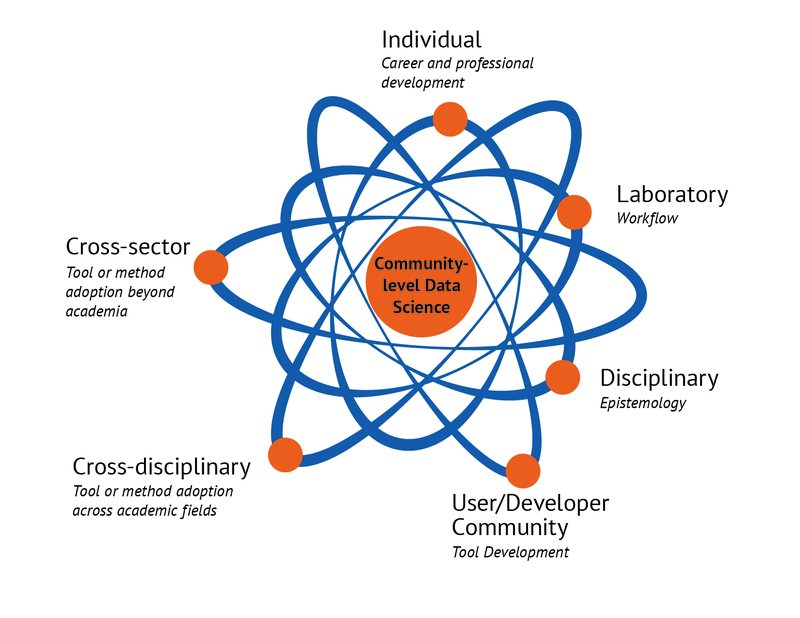 As one of us has discussed elsewhere, perhaps a more realistic characterization of data science includes a network of differently shaped scientists practicing data science on a community level. 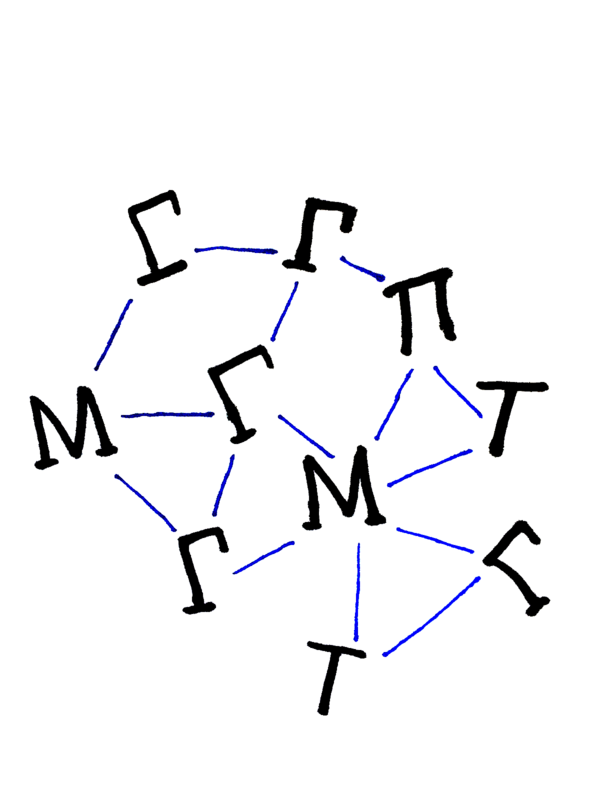 T, Π, Γ, Μ network. A network view of community-level data science reveals a mix of T-shaped, Γ-shaped, Μ-shaped, and Π-shaped scientists practicing data science. In order to understand what practicing data science looks like more precisely we embedded ourselves in the Data Science Incubator (DSI) program at University of Washington’s eScience Institute so that we could observe a cross-section of data science collaborations from across the campus. DSI is a program that aims to bring together data scientists and domain scientists to work on focused, intensive, collaborative projects over the course of an academic quarter. The program solicits proposals from scientists across campus for projects that require data science expertise. The accepted applicants are then paired with one or two data science liaisons at the eScience Institute. As ethnographers we were participant observers in the DSI and found that it represents a promising model for cultivating what we term community-level data science. Instead of breeding unicorns that embodied the singular, ideal “data scientist”, we found that the DSI fosters data science practice on the community level such that work is distributed across domain and methods-based approaches and occurs at the intersections of these different forms of expertise. Beyond acknowledging the DSI’s role in advancing their particular research projects, participants articulated an awareness that they were engaged the process of learning what it means to be part of a data science community. In other words, participants recognized data science as a cultural practice. As such, the novelty-squared model falls short of sufficiently characterizing the DSI interactions. Our respondents didn’t talk about the value of data science solely, or even first and foremost, in terms of simultaneously pushing the known limits of domain knowledge and computational methods. Rather, they imagined the “novel” in data science as its ability to influence a range of day-to-day work practices and to expand an array of scientific and professional possibilities. This program provides a window into a range of data science collaborations that have significant value without all being characterized by a novelty squared approach. How do we make sense of this range of interactions and understand the different motivations and values that are imagined by participants? Based on our ethnographic observations of this program and interviews with all participants we categorized the different kinds of value we heard participants imagine and ascribe to data science into six spheres of influence. Data science in this case is imagined to be influencing the sphere of the individual by providing researchers with skills, tools, and data that can help them advance their career and professional goals. What was important about this person’s data science incubator experience was the acquisition of new skills and tools that would allow her to streamline and optimize work routines across a team of faculty and student researchers. For a number of participants, it is not necessarily about scientific advancement in the short term; rather it is about investing in scientific advancement and productivity in the long term. This perspective foregrounds the potential for community-level data science to influence the sphere of the laboratory. This person sees data science as providing a new way of knowing, or introducing epistemological novelty to his particular domain. So in this case, we can consider data science to be influencing the disciplinary sphere. Because the contributions she made could potentially affect anyone who is using or developing the new tool, in this case we’ve characterized community-level data science as influencing the sphere of the user/developer community. In cases like this, the methods and tools being developed could be applied to similar data generated and analyzed across different academic domains. Therefore, we can think of community-level data science as potentially influencing the cross-disciplinary sphere. Because this person envisions taking software that was developed for academic research and adapting it for use in a commercial setting, we can say that the imagined influence of data science is taking place in a cross-sector sphere that spans academic and commercial sectors, as well as public and private sectors. As these examples show, we found that the wide ranging imaginations for the value of data science were often not at the level of “novelty squared.” To be sure, many of the DSI projects would have been intractable without the incubator; posing research questions the participants couldn’t or wouldn’t otherwise ask. In some cases this novel science required a specific input and contributions from the data science liaisons and in other cases the novel science was supported through the dedicated time for elbow-to-elbow learning of tools and techniques from the data science canon. But the incubator participants often characterized what were major breakthroughs for them as trivial tasks for their data science liaisons. In other words, we didn’t see much of the idealized imagination of a data science that simultaneously pushes the frontiers of domain knowledge and computational methods. When the projects did seem to be pursuing novelty squared, some participants were ambivalent about that dual trajectory and identified a tension between the mandate to develop novel computational tools and techniques on the one hand, and the mandate of doing what was best for their science on the other hand. But that’s a topic for another installment. Nonetheless, as we’ve shown, for these participants, the data science work accomplished in the DSI was imagined to be novel and transformational within a range of spheres. Many of the researchers we observed saw value in becoming acculturated to the data science community. They talked about how learning the languages, tools, processes, and norms of data science would advance their careers, allow them to keep pace with the trends in their fields, optimize their work routines, alter the repertoires of their disciplines and subdisciplines, and connect them to the array of expertise and resources their research required. In addition to incubating science projects, the DSI incubates researchers within a data science community in which they are immersed in the cultural language of data science, learning how to think like a data scientist and how to be part of a data science community. As such, if we want to understand the evolution of data science in academia, we need to recognize that it is not solely about developing the capacity of individual researchers to employ novel methods, but also about forging a community-level data science that can reshape the cultural contours of the academy.